The owner of a listed basement flat in Seven Dials has been told to restore the original features he ripped out during a luxury refit. Ali Bilal bought the Grade II* listed flat in Montpelier Crescent in 2016 and started a refit shortly afterwards, in which a staircase, fireplace, internal wall and outbuilding were ripped out, one door bricked up and another replaced with a French window. Original doors, skirting and cupboards were also replaced with modern equivalents, new partition walls created, and decking and seating installed in the courtyard garden. Once he became aware that permission was needed for the works, he applied to Brighton and Hove City Council in December 2017, but this was refused. A planning enforcement notice has now been issued requiring him to rip out large parts of the refit and replace with features matching the original ones by February next year. The council’s heritage officer Jody Blake said: “Little historic fabric remains within the basement flat. 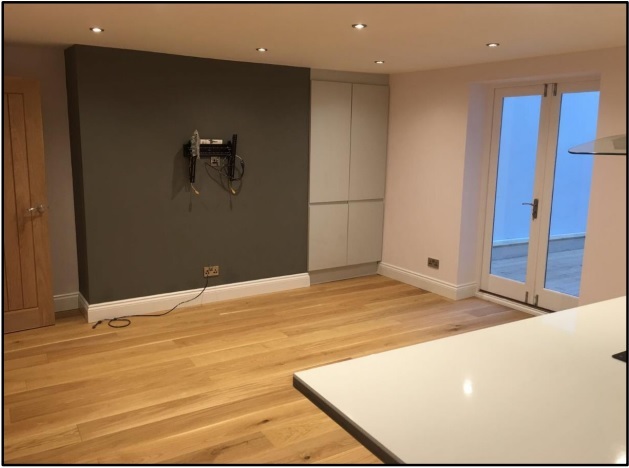 “Due to the extent of unauthorised works which have been undertaken, this assessment has had to be undertaken utilising online photographs from a real estate website. “Unfortunately, basements have often suffered more from past inappropriate alterations than other floors in the mistaken belief that they are of lesser importance. Therefore those that do remain in anything like their original layout will be considered to be especially important and major alterations will not be considered acceptable. Mr Bilal’s planning consultants Lewis & Co argued that the works made it more likely that it would continue to be used as a home. They also argued that the main heritage significance of the building is the Regency sweep of the crescent as a whole, which had not been altered by the internal works to one basement flat. But these arguments failed to convince planning officers, and the case was referred to the planning enforcement team for further investigation. The enforcement notice requires that all the modern skirting and doors are replaced with ones matching the originals, the original cupboards are rebuilt, two period fireplaces reinstated and a partition wall rebuilt. However, the French window and loss of a staircase and another partition wall which made way for a high end kitchen are not included in the notice. A subsequent planning application proposing that the French window be replaced with one more in keeping with the period features was approved on the basis that it was not possible to reinstate the original lost window. the repeated occurrence of two things in turn. Ooh, thanks for picking that up! Copied and pasted from the report, but I didn’t spot it . . .